There was in Athens a house, large and spacious, which had a bad reputation as though it was filled with pestilence. In the dead of night, a noise was frequently heard resembling the clashing of iron which, if you listened carefully, sounded like the rattling of chains. The noise would seem to be a distance away, but it would start coming closer… and closer… and closer. Immediately after this, a specter would appear in the form of an old man, emaciated and squalid, with bristling hair and a long beard, and rattling the chains on his hands and feet as he moved. The unfortunate inhabitants of the house went sleepless at night due to unimaginable and dismal terrors. Without sleep, as it had happened to others, their health was ruined and they were struck with some kind of madness – as the horrors in their minds increased, they were led on a path toward death. Eventually even during the daytime, when the ghost did not appear, the memory of their nightmares was so strong that it still passed before their eyes, every waking moment. Their terror was constant, even when the source of fear was gone. Because of this, the house was eventually deserted and damned as uninhabitable, abandoned entirely to the ghost. In hope that some tenant might eventually be found who was ignorant of the house’s malevolence, a bill was still posted for its sale. As it happened, a philosopher by the name of Athenodorus came to Athens at that time. Reading the bill for the house, he easily discovered the price – and being an intelligent man, he was suspicious at its extremely low cost. Someone did tell him the whole story, and yet he wasn’t dissuaded, but was instead eager to make the purchase. Thus, he did. When evening drew near, Athenodorus asked for couch to be readied for him at the front of the house. He asked for his writing materials and a lamp, and then asked his retainers to retire for the night. In order to ensure that his mind stayed focused and away from distractions of stories about imaginary noises and apparitions, he poured all his energy into his writing. For awhile, the night was silent. Then the rattling of fetters began. Athenodorus would not lift his eyes or set down his pen. Instead, he concentrated on his writing and thereby closed his ears. But the noise wouldn’t stop, and it only increased and drew closer until it seemed to be at the door and then standing in his very chamber! 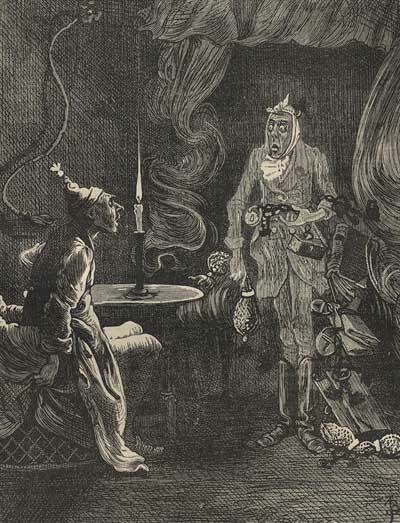 Finally, Athenodorus looked away from his work… and saw the ghost standing just as it had been described. It stood there, waiting, beckoning him with one finger. Athenodorus held up his palm as though the visitor should wait a moment, and once again bent over his work. 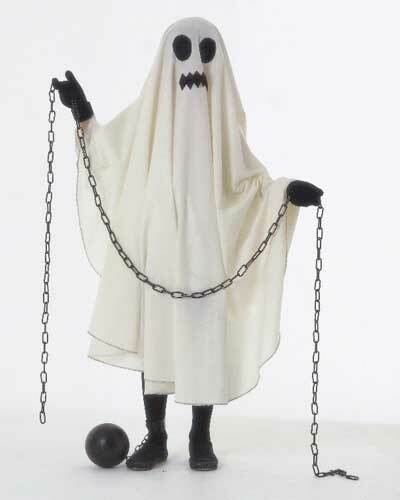 The ghost, impatient, shook his chains over the philosopher’s head, beckoning again. This time, Athenodorus picked up his lamp and followed the ghost as it moved slowly, as though it was held back by its chains. Upon reaching the courtyard, the ghost suddenly vanished. Now on his own, Athenodorus carefully marked the spot where the ghost vanished with a handful of leaves and grass. The following day, he asked the magistrate to have that spot dug up, and in that spot was found – intertwined with chains – the skeleton of a man. The body had lain in the ground a long time and had left the bones bare and corroded by the fetters. The bones were then collected and given a proper burial at public expense – and since the ghost’s tortured soul had been finally laid to rest, the house in Athens was haunted no more.